Our Safety and Risk group includes a number of highly qualified and experienced consultants from academic, operational, design and maintenance backgrounds who use proven tools and techniques to provide fast responses to safety, risk and reliability issues. The ACM team is efficient, well-organized and able to keep everyone on track. HAZOP, HAZID, LOPA, What-If, CHAZOP, FMEA, Staffing Study, Design Review, etc. ACM provides facilitation services for risk assessments in all stages of a facility lifecycle, from Hazard Identification in the design phase through to Revalidation Assessments during the facility operating life. Through both rigorous training and project experience with an extensive list of clients, ACM consultants are experts in a wide range of risk assessments techniques. Further, all ACM consultants have TÜV Rheinland Functional Safety certification in the area of Process Hazard Analysis and Risk Assessment. At ACM, we understand that a large portion of work towards improving safety at your facility occurs after the risk assessment is complete, and includes a much larger group of stakeholders. Therefore, we guarantee session Data Dumps within 24 hours and IFR reports within 10 business days of session completion. Our facilitation teams also follow a specific documentation methodology which ensures that these reports, and their associated action items, are easily understood by those not present during the session. In addition, ACM has developed a set of Analytics to ensure our clients can extract maximum value from their facilitated risk session and allocate their resources in the most efficient manner. ACM helps clients build effective SIL Life Cycle programs that include the development, implementation and maintenance of high integrity and critical control systems. These programs enable operations to effectively manage and monitor changes in design and design assumptions. Utilizing our proprietary toolsets, guided by the principles of IEC 61508 and IEC 61511 (Clauses 8 through 15), and applying our in-house expertise we help to make sense of the complicated world of safeguard engineering, ensuring facilities remain safe and operable. When conducting SIL Verification studies and developing Safety Requirement Specifications, ACM engages the most experienced professionals to work with our clients. This includes not just one, but several TÜV Rheinland Functional Safety certified individuals. There is a strong focus on maintaining clear communication to ensure information is requested and flows in a timely manner. The keys to a successful SIL V and SRS development project are leveraging knowledgeable personnel and good communication. To assist in maintaining consistency and quality during the project, it is essential to utilize a robust software tool. ACM consultants use our in-house Safeguard Profiler tool which has been built and refined based on our teams’ extensive field experience. With Profiler, a user can create one central repository of information incorporating data from the HAZOP study, LOPA report native file, SIL Verification calculation engine and reports, as well as the Safety Requirement Specification. This cohesive, all-encompassing, full lifecycle tool will eliminate the need to pass information from one tool to the other. The tool will complete complex calculations and build complex models in a user friendly way that is easy to interpret for everyone working on the project including operations, maintenance and those with less experience in SIF design. Hazard Assessment Selection, Risk Assessment, SIL Verification, SIS Operation & Maintenance, PSSR, MOC, etc. One of the biggest challenges for growing companies when building Process Safety Management (PSM) programs or designing facilities is consistency. It is important to have procedures for risk management in place so that each employee understands their responsibilities and so that all actions are performed in a consistent method across any current projects and in all future activities. ACM Facility Safety has 20 years of experience in helping our clients build and operate safer facilities and more than 150 years of collective experience in our team. Many clients have engaged us to produce standards and procedures to aid them in ensuring a consistent approach and methodology in how they perform PSM related activities. Working with clients to build procedures that work for their organizations is one of ACM’s strongest service offerings. Successful procedure development requires input and guidance from the client organization. ACM will start with our standard templates and work with a designated client representative(s) to ensure that all the standards developed are consistent with the client organization’s views and plans. A standard can only be successfully implemented if it is built to fit with the client’s vision and wishes in mind. Here at ACM Facility Safety we develop client procedures with the intent of providing the framework for a consistent, thorough approach to be used in PSM activities in order to sustain a safe, environmentally responsible and reliable plant operation. The Pre-Safety Start-up Review (PSSR) is a safety assessment that can be conducted on both new and revamped processing/manufacturing facilities to determine whether it is ready for startup. This review ensures that all installations meet the original detailed engineering design and operating intent while considering potential operating hazards. Simply put, is the facility ready for startup with potential hazards identified? The PSSR package offered by ACM is customized to each client’s needs. Typically, it includes a safety review procedure which assesses equipment and their operating modes, work procedures and required personnel training. The central tool for risk assessment studies is a Risk Matrix. The matrix defines the boundaries between acceptable and unacceptable risks, and helps lead decision making during the session. 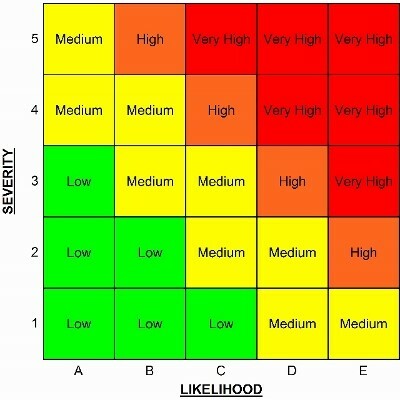 Having a risk matrix that clearly communicates the risk levels, has clear severity and likelihood descriptions, defines the required corporate actions for acceptability, and is calibrated to match the operating company’s risk tolerance will lead to improved decision making with outcomes that are understood by all stakeholders. ACM has worked with both large and medium client organizations to providing consulting services supporting the building and calibration of their risk matrixes to improve the alignment between corporate objectives and risk tolerance. The Safety Culture Self-Assessment is a platform for receiving a diagnostic on your organizations safety culture, the development of a plan to support Process Safety initiatives in the organization, and to improve your foundational knowledge. This is accomplished through a two day workshop which involves field level leaders, the senior operational leaders and the executive support group. The first day assesses a client’s safety culture by having a range of field level leaders and operators answering a series of 25 questions. At the end of this session you will have a solid diagnosis of your safety culture, where it is robust, and where improvements could be made. The feedback from this workshop is then shared with Senior Management and Executives on the next day of the workshop. During the second day, senior operational leaders and the executive support group participate in a company specific leadership development session with respect to Process Safety Management. The objective will be to improve knowledge and skills among the participants and highlight the consequences of poor Process Safety considerations. The results of the self-assessment workshop are also reviewed in detail. Before heading down the path of developing a process safety management program, it is important for organizations to have clearly defined goals that have been shared and aligned with employees. This is a major stepping stone for success as everyone is knowledgeable of the goal and shares the same mentality. The Strategic Planning Workshops offered by ACM Facility Safety is intended to help clients clearly define the purpose of the activity, determine if the right organizational pieces are involved, and identify whether or not a course correction is required. Strategic planning aims to take today’s impact and profitability and improve it to a future desired state by developing “leap frogs” in order to catch a safety vision. ACM offers comprehensive contingency planning packages which go hand in hand with our SafeGuard Sentinel software. Contingency plans are developed for safeguards which are assigned risk reduction credit in risk assessment studies. Sentinel and contingency planning together, can reduce training time for new operators, decrease operational risk exposure, allow safeguard failures to be fixed quickly and safely, improve plant uptime, increase production and drive good safety culture. Benchmark current practice - Undertake and document a ‘gap assessment’ of the organizations functional safety management system against IEC 61508 and IEC61511 to establish the scope of the task. Facility Siting is used to assess the location of buildings based upon known hazards. ACM is a leading provider of facility siting services, performing many corporate facility siting studies for a wide range of explosion, fire and toxic material hazards in refining, petrochemical and specialty chemical processes. OSHA's PSM regulations require that facility siting be addressed in Process Hazard Analysis (PHA). Facility siting involves the assessment of the possible impacts of fire and explosion on life safety, structures, and equipment as well as the effects of releases of toxic substances and their ingress into buildings. Facility siting includes, but is not limited to, the spatial relationship between the hazards of a process and the location(s) of people in the facility, particularly in occupied buildings such as control rooms.